Andrew Jones Auctions’ Design for the Home and Garden auction on March 3 will feature over 400 lots of fine furniture, art, jewelry, silver, ceramics, decorative arts, carpets and design from prominent local collections and estates. 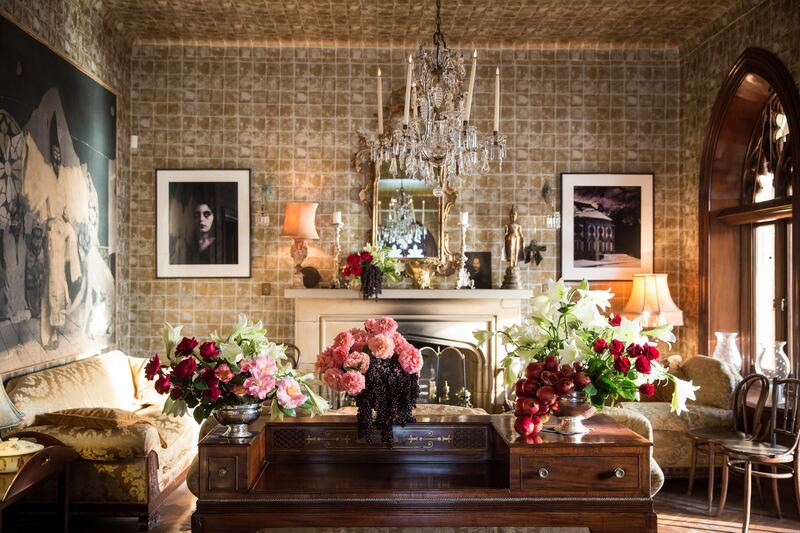 “Sparkling diamonds, ancient artifacts, modern art, antique furniture and much more will be on display in our Design for the Home and Garden sale,” said company president and CEO Andrew Jones. Fine jewelry will be led by pieces from iconic American jeweler David Webb, including a bold diamond and platinum foliate brooch (est. $10,000-15,000). 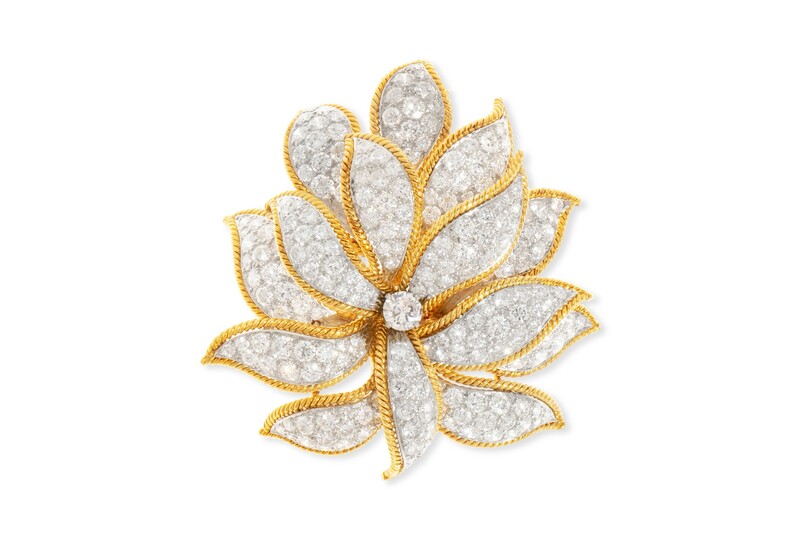 Fine jewelry will be led by pieces from iconic American jeweler David Webb, including a bold diamond and platinum foliate brooch (est. $10,000-15,000); a pair of gorgeous diamond, gold and blue enamel bracelets (est. $8,000-12,000); and a geometric diamond and gold statement bracelet (est. $20,000-30,000). Other stellar lots include a 22-carat star sapphire and diamond ring (est. $10,000-15,000) and a Cartier gold and steel Pasha chronograph (est. $2,000-3,000). Fine late 17th century German late Renaissance marquetry inlaid walnut table cabinet, probably Augsburg or Nuremberg (est. $15,000-20,000). Fine furniture of all origins, periods and styles will include a Spanish Baroque gilt and painted mirror (est. 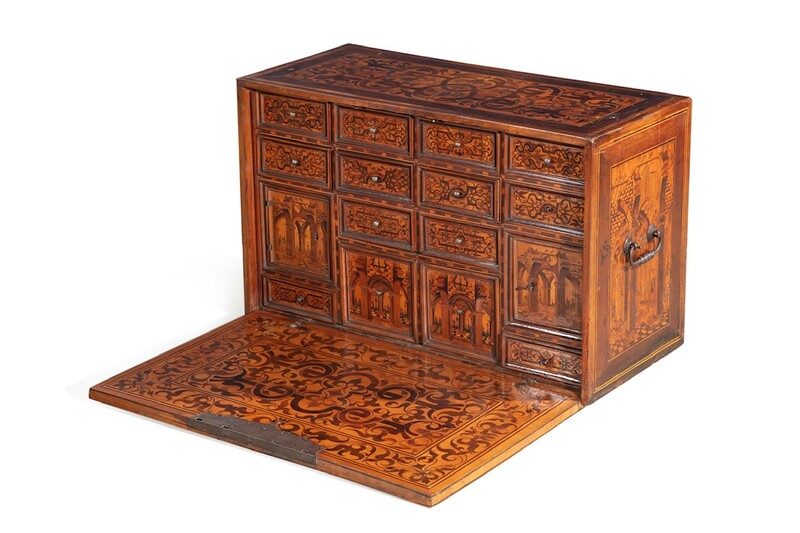 $8,000-12,000); an exquisite German late Renaissance marquetry table cabinet, Augsburg or Nuremberg (est. $15,000-20,000); and a Louis XV kingwood and tulipwood commode by Louis Michel Lefèvre from the estate of a Malibu collector (est. $2,000-3,000). Fine Louis XVI style gilt bronze mounted plum pudding mahogany and parquetry bureau plat by Francois Linke (Paris, circa 1900) (est. $4,000-6,000). 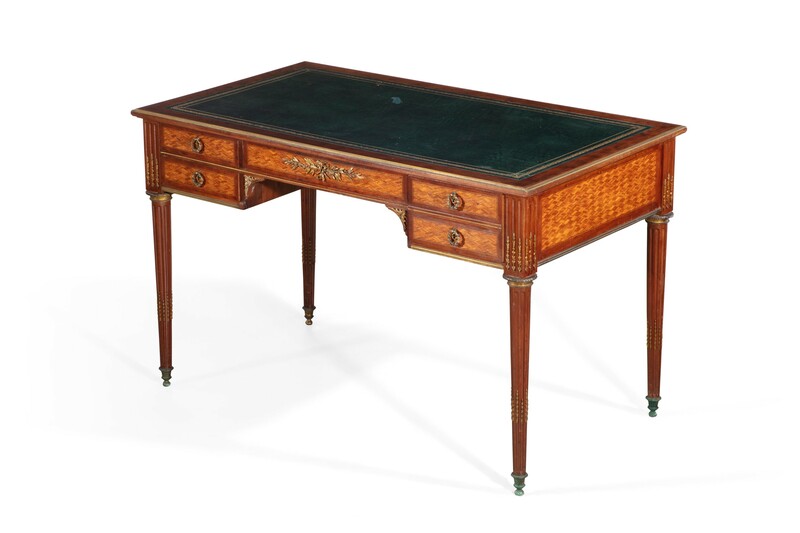 The same Malibu collection will offer a Louis XVI style bureau plat by François Linke (est. $4,000-6,000); and a Louis XVI style inlaid mahogany and bois satiné vitrine cabinet by Paul Sormani (est. $4,000-6,000). As a touch of the gent’s library, there is an unusual George III metamorphic library bench (est. $3,000-4,000). A pair of Empire mahogany chaises by François-Honoré-Georges Jacob-Desmalter from the collection of Tom Buckley bear the inventory marks of Napoleon’s Imperial Garde Meuble. They will be offered as a single lot (est. $1,500-2,000). 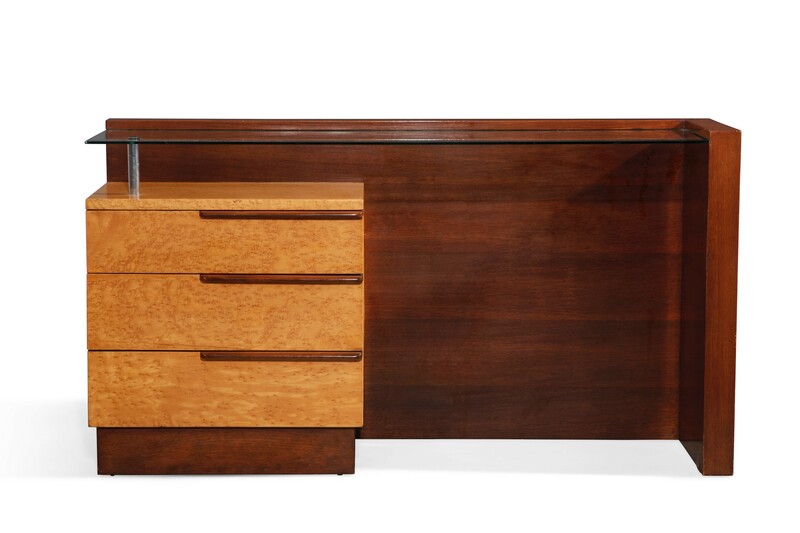 Art Deco Gilbert Rohde for Herman Miller bird's eye maple and walnut vanity, #3626, designed 1936 (est. $1,000-1,500). A suite of Gilbert Rohde for Herman Miller furniture, including side cupboards, chests and a vanity (est. $800-1,500) is from the collection of Michelle and Gavin Langley, for those looking for Art Deco style. 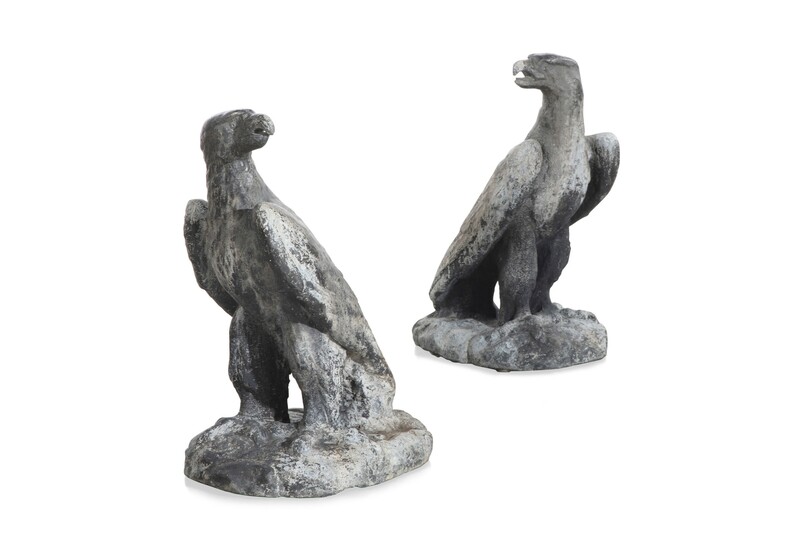 Pair of 19th century English lead eagle form gatepost finials (est. $1,000-1,500). Garden furnishings include a set of six Rose Tarlow wrought iron chairs (est. $600-800) and a pair of 19th century English eagle form lead gate post finials (est. $1,000-1,500). 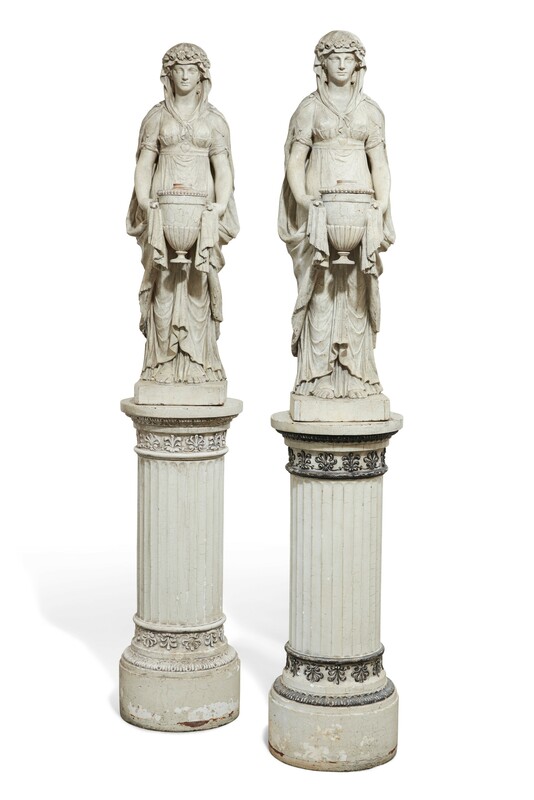 Pair of English Regency 19th century white painted terra cotta figures of vestal virgins, on later pedestals (est. $3,000-5,000). Decorative arts will feature an Italian carved marble figure of Psyche by Ferrarini (est. $12,000-18,000), from the collection of Tom Buckley; a pair of Swedish Empire gilt bronze and marble figural candelabra (est. $3,000-5,000); a pair of Regency painted terracotta figures of vestal virgins (est. 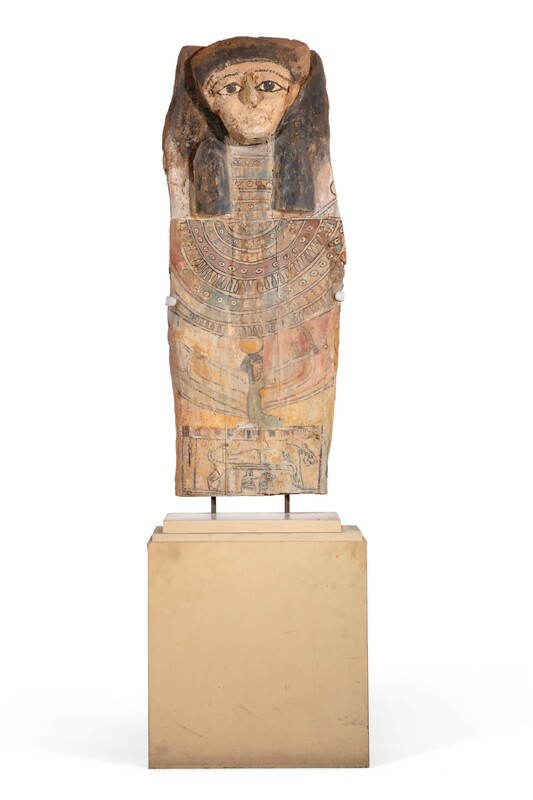 $3,000-5,000); and a Neoclassicism and the Empire style-inspired, nearly 3,000-year-old Egyptian sarcophagus lid (est. $600-800), formerly in the collection of Larry Hagman. Egyptian polychrome decorated sarcophagus cover from the late Period to Ptolemaic Period, circa 664-30 BC, formerly in the collection of the late actor Larry Hagman. (est. $600-800). Additional items include a King’s Husk pattern silver flatware service for eighteen by Paul Storr (est. 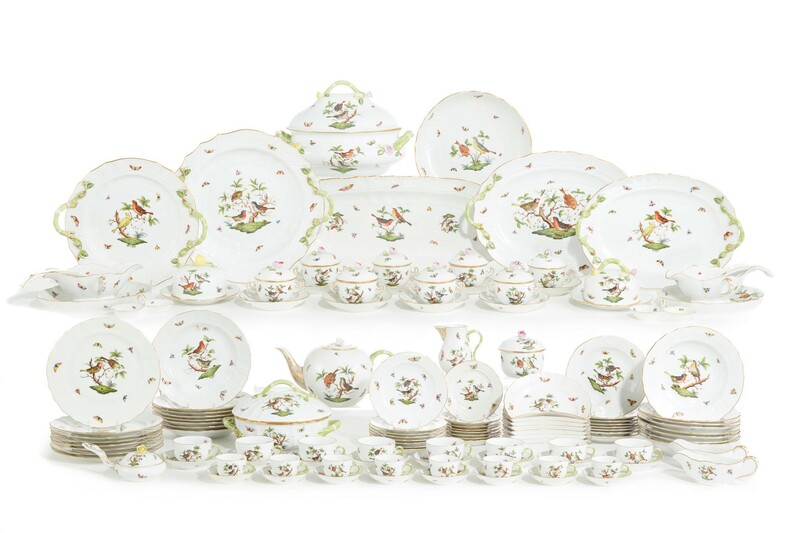 $1,500-2,500); and an extensive forty-three lot Herend dinner service in the Rothschild Bird pattern from the collection of Fima Ruchman (estimates range from $150-250 to $1,500-2,000). An extensive forty-three lot Herend dinner service in the Rothschild Bird pattern from the collection of Fima Ruchman has estimates ranging from $150-250 to $1,500-2,000. 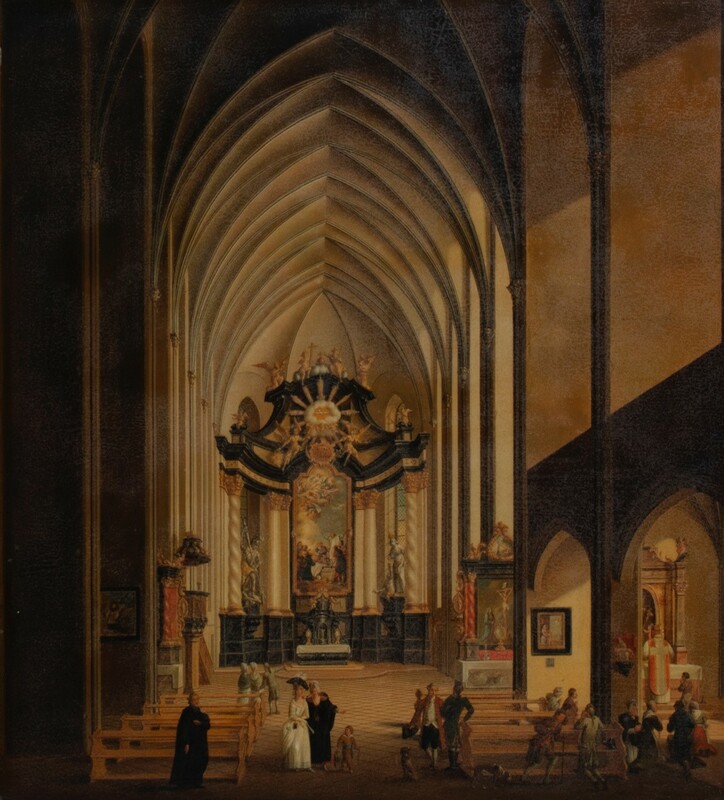 An oil on copper scene of a Gothic cathedral Johann Ludwig Ernst Morganstern (German, 1738-1819) has a pre-sale estimate of $10,000-15,000 and will highlight the centuries of fine art in the sale. Oil on copper scene of a Gothic cathedral with Baroque baldacchino and figures by Johann Ludwig Ernst Morganstern (German, 1738-1819) (est. $10,000-15,000). Three Robert Graham figural bronze sculptures and reliefs, including Gabrielle, 1998 (est. $4,000-6,000) as well as British Modernist paintings by Frank Beanland (est. $1,000-1,500) and Halima Nalecz (est. $300-500) round out the fine art offerings spanning centuries in the auction. British Modernist paintings by Frank Beanland (British, b. 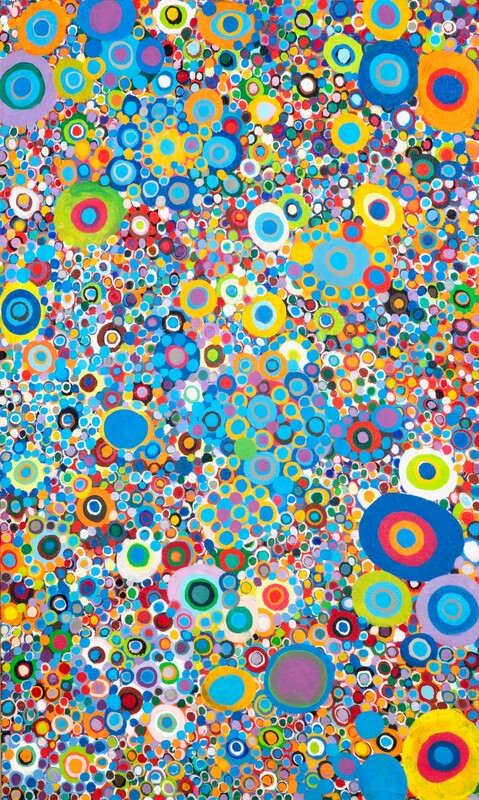 1936) will include this oil on canvas titled Turquoise and yellow clusters, 1970 (est. $1,000-1,500).